When I first got involved in the creationism/evolution controversy, back in early 1995, I looked around for an article or book that explained radiometric dating in a way that nonscientists could understand. I couldn't find one. So I set out to write one. This article was the result. Radiometric dating methods are the strongest direct evidence that geologists have for the age of the Earth. All these methods point to Earth being very, very old -- several billions of years old. Young-Earth creationists -- that is, creationists who believe that Earth is no more than 10,000 years old -- are fond of attacking radiometric dating methods as being full of inaccuracies and riddled with sources of error. When I first became interested in the creation-evolution debate, in late 1994, I looked around for sources that clearly and simply explained what radiometric dating is and why young-Earth creationists are driven to discredit it. I found several good sources, but none that seemed both complete enough to stand alone and simple enough for a nongeologist to understand them. Thus this essay, which is my attempt at producing such a source. What is radiometric dating? Simply stated, radiometric dating is a set of methods for determining the age of a sample of material using the decay rates of radioactive isotopes to provide a 'clock.' It relies on three basic rules, plus a couple of critical assumptions. The rules are the same in all cases; the assumptions are different for each method. To explain those rules, I'll need to talk about some basic atomic physics. There are 90 naturally occurring chemical elements. Each element is identified by its atomic number, the number of protons in the atom's nucleus. 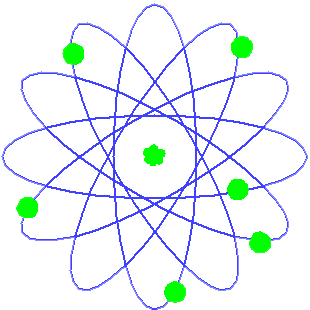 All atoms except the simplest, hydrogen-1, have nuclei made up of protons and neutrons. Hydrogen-1's nucleus consists of only a single proton. Protons and neutrons together are called nucleons, meaning "particles that can appear in the atomic nucleus." An isotope of an element, also called a nuclide of an element, is an atom of that element that has a specific number of nucleons. Since all atoms of the same element have the same number of protons, different isotopes of an element differ in the number of neutrons they contain. For example, hydrogen-1 and hydrogen-2 are both isotopes of the element hydrogen, but hydrogen-1's nucleus contains only a proton, while hydrogen-2's nucleus contains a proton and a neutron. Uranium-238 contains 92 protons and 146 neutrons, while uranium-235 contains 92 protons and 143 neutrons. To keep it short, an isotope is usually written using the element's abbreviation. Uranium's abbreviation is U, so uranium-238 can be more briefly written as U238. Most isotopes are stable. A stable isotope will always remain as it is unless some external force changes it. Some, however, are unstable. Given time, an unstable isotope will spontaneously undergo one of the several kinds of radioactive decay, changing in the process into another element. Many types of radioactive decay are known, but only three are significant for this article:alpha decay, beta decay, and positron emission. In alpha decay, the radioactive atom emits an alpha particle. An alpha particle contains two protons and two neutrons, and is usually represented by a lowercase Greek letter alpha, α. After emission, it quickly picks up two electrons to balance the two protons, and becomes an electrically neutral helium-4 (He4) atom. Meanwhile, the parent atom's atomic number drops by 2, and its mass number (number of nucleons) drops by 4. Thus, an atom of U238 (uranium, atomic number 92) emits an alpha particle and becomes an atom of Th234 (thorium, atomic number 90). Physicists usually write this as "U238 --> Th234 + α". In beta decay, the radioactive atom emits a beta particle. A beta particle is just an electron, and is usually represented by a lowercase Greek letter beta, β. To balance the electron's negative electric charge, a neutron inside the nucleus is transformed to a proton. The mass number doesn't change, but the atomic number goes up by 1. Thus, an atom of carbon-14 (C14), atomic number 6, emits a beta particle and becomes an atom of nitrogen-14 (N14), atomic number 7. Physicists usually write this as "C14 --> N14 + β". Positron emission is the exact opposite of beta decay: a proton inside the nucleus transforms to a neutron, emitting a positively-charged particle called a positron in the process. The parent atom's atomic number goes down by 1, but the mass number doesn't change. So an atom of potassium-40 (K40), atomic number 19 emits a positron and becomes an atom of argon-40 (Ar40), atomic number 18. Since a positron is merely a positively-charged electron, this process is written as "K40 --> Ar40 + β+". It's important to understand that the half-life is a purely statistical measurement. It doesn't depend on the age of individual atoms. A sample of U238 ten thousand years old will have precisely the same half-life as one ten billion years old. So, if we know how much of the isotope was originally present, and how much there is now, we can easily calculate how long it would take for the missing amount to decay, and therefore how long it's been since that particular sample was formed. That's the essence of radiometric dating: measure the amount that's present, calculate how much is missing, and figure out how long it would take for that quantity of the isotope to break down. Because it's a statistical measurement, there's always a margin of error in the age figure, but if the procedure is done properly, the margin is very small. Obviously, the major question here is "how much of the isotope was originally present in our sample?" In some cases, we don't know. Such cases are useless for radiometric dating. We must know the original quantity of the parent isotope in order to date our sample radiometrically. Fortunately, there are cases where we can do that. In order to do so, we need an isotope that's part of a mineral compound. Why? Because there's a basic law of chemistry that says "Chemical processes like those that form minerals can't distinguish between different isotopes of the same element." This is because an element's chemical behavior depends only on the number of electrons it has, which is the same as its number of protons. So to a chemical process, U235 and U238 are identical. If an element has more than one isotope present, and a mineral forms in a magma melt that includes that element, the element's different isotopes will appear in the mineral in precisely the same ratio that they occurred in the environment where and when the mineral was formed. This is the second axiom of radiometric dating. The third and final axiom is that when an atom undergoes radioactive decay, its internal structure and also its chemical behavior change. Losing or gaining atomic number puts the atom in a different row of the periodic table, and elements in different rows behave in different ways. The new atom doesn't form the same kinds of chemical bonds that the old one did. It may not form the same kinds of compounds. It may not even be able to hold the parent atom's place in the compound it finds itself in, which results in an immediate breaking of the chemical bonds that hold the atom to the others in the mineral. Why not? you might ask. Well, an atom's chemical activity pattern is a result of its electron shell structure. (The exact details of this are rather complicated, so I won't go into them here.) When the number of electrons change, the shell structure changes too. So when an atom decays and changes into an atom of a different element, its shell structure changes and it behaves in a different way chemically. That's it. That's the sum total of the chemical and physical basis of radiometric dating. That's all you really need to know to understand radiometric dating techniques. How do these axioms turn into useful science? In the next part of this article, I'll examine several different radiometric dating techniques, and show how the axioms I cited above translate into useful age measurements. This section describes several common methods of radiometric dating. To start, let's look at one that almost everyone has heard of: radiocarbon dating, AKA "carbon-14 dating" or just "carbon dating." The element carbon occurs naturally in three isotopes: C12, C13, and C14. The vast majority of carbon atoms, about 98.89%, are C12. About one atom in 800 billion is C14. The remainder are C13. Of the three, C12 and C13 are stable. C14 is radioactive, with a half-life of 5730 years. C14 is also formed continuously from N14 (nitrogen-14) in the upper reaches of the atmosphere. And since carbon is an essential element in living organisms, C14 appears in all terrestrial (landbound) living organisms in the same proportions it appears in the atmosphere. Plants and protists get C14 from the environment. Animals and fungi get C14 from the plant or animal tissue they eat for food. When an organism dies, it stops taking in C14. The C14 already in the organism doesn't stop decaying, so as time goes on there is less and less C14 left in the organism's remains. If we measure how much C14 there currently is, we can tell how much there was when the organism died, and therefore how much has decayed. When we know how much has decayed, we know how old the sample is. Many archaeological sites have been dated by applying radiocarbon dating to samples of bone, wood, or cloth found there. Radiocarbon dating depends on several assumptions. One is that the thing being dated is organic in origin. Radiocarbon dating does not work on anything inorganic, like rocks or fossils. Only things that once were alive and now are dead: bones, teeth, flesh, leaves, etc. The second assumption is that the organism in question got its carbon from the atmosphere. A third is that the thing has remained closed to C14 since the organism from which it was created died. The fourth one is that we know what the concentration of atmospheric C14 was when the organism lived and died. The story of radiocarbon dating shows science at its finest. Presented with a new method that gave answers different than existing methods, the scientists involved did not simply assume that either the old method or the new one was wrong. They viewed the problem as a challenge, dug into it with all their energy, and didn't stop until they understood exactly why their C14 dates disagreed with traditional dates, what was wrong with their C14 procedures, and how to compensate for the problems in the future. That last one is more important than it sounds. When Professor William Libby developed the C14 dating system in 1949, he assumed that the amount of C14 in the atmosphere was a constant. However, after a few years a number of scientists got suspicious of this assumption, because dates obtained by the C14 method weren't tallying with dates obtained by other means. A long series of studies of C14 content produced an equally long series of corrective factors that must be taken into account when using C14 dating. So the dates derived from C14 decay had to be revised. One reference on radiometric dating lists an entire array of corrective factors for the change in atmospheric C14 over time. C14 dating serves as both an illustration of how useful radiometric dating can be, and of the pitfalls that can be found in untested assumptions. U238 and U235 are both isotopes of the element uranium. U235 is well known as the major fissionable isotope of uranium. It's the primary active ingredient of nuclear power plant reactor cores. It has a half-life of roughly 700 million years. U238 is more stable, with a half-life of 4.3 billion years. Th232 is the most common isotope of the element thorium, and has a half-life of 13.9 billion years. Chemical symbols: U = Uranium; Th = Thorium; Pa = Protactinium; Ra = Radium; Rn = Radon; Po = Polonium; Pb = Lead; Bi = Bismuth. α = alpha particle (alpha decay); β = beta particle (beta decay). We can calculate the half-lives of all of these elements. All the intermediate isotopes between U238 and Pb206 are highly unstable, with short half-lives. That means they don't stay around very long, so we can take it as given that these isotopes don't appear on Earth today except as the result of uranium decay. We can find out the normal distribution of lead isotopes by looking at a lead ore that doesn't contain any uranium, but that formed under the same conditions and from the same source as our uranium-bearing sample. Then any excess of Pb206 must be the result of the decay of U238. When we know how much excess Pb206 there is, and we know the current quantity of U238, we can calculate how long the U238 in our sample has been decaying, and therefore how long ago the rock formed. Th232 and U235 also give rise to radioactive series -- different series from that of U238, containing different isotopes and ending in different isotopes of lead. Chemists can apply similar techniques to all three, resulting in three different dates for the same rock sample. (Uranium and thorium have similar chemical behavior, so all three of these isotopes frequently occur in the same ores.) If all three dates agree within the margin of error, the date can be accepted as confirmed beyond a reasonable doubt. Since all three of these isotopes have substantially different half-lives, for all three to agree indicates the technique being used is sound. But even so, radioactive-series dating could be open to question. It's always possible that migration of isotopes or chemical changes in the rock could yield incorrect results. The rock being dated must remain a closed system with respect to uranium, thorium, and their daughter isotopes for the method to work properly. Both the uranium and thorium series include isotopes of radon, an inert gas that can migrate through rock fairly easily even in the few days it lasts. To have a radiometric dating method that is unquestionably accurate, we need a radioactive isotope for which we can get absolutely reliable measurements of the original quantity and the current quantity. Is there any such isotope to be found in nature? The answer is yes. Which brings us to the third method of radiometric dating . . . The element potassium has three isotopes, K39, K40, and K41. Only K40 is radioactive; the other two are stable. K40 is unusual among radioactive isotopes in that it can break down two different ways. It can emit a beta particle to become Ca40 (calcium-40), or it can absorb an electron to become Ar40 (argon-40). Argon is a very special element. It's one of the group of elements called "noble gases" or "inert gases". Argon is a gas at Earth-normal temperatures, and in any state it exists only as single atoms. It doesn't form chemical compounds with any other element, not even the most active ones. It's a fairly large atom, so it would have trouble slipping into a dense crystal's molecular structure. By contrast, potassium and calcium are two of the most active elements in nature. They both form compounds readily and hold onto other atoms tenaciously. What does this mean? It means that potassium can get into minerals quite easily, but argon can't. It means that before a mineral crystallizes, argon can escape from it easily. It also means that when an atom of argon forms from an atom of potassium inside the mineral, the argon is trapped in the mineral. So any Ar40 we find deep inside a rock sample must be there as a result of K40 decay. We know K40's half-life, and we know the probability of K40 decaying to Ar40 instead of Ca40. That and some simple calculations produce a figure for how long the K40 has been decaying in our rock sample. However, again it's important to remember that we're dealing with assumptions, and we always have to keep in mind that our assumptions may be wrong. What happens if our mineral sample has not remained a closed system? What if argon has escaped from the mineral? What if argon has found its way into the mineral from some other source? If some of the radiogenic argon has escaped, then more K40 must have decayed than we think -- enough to produce what we did find plus what escaped. If more K40 has decayed than we think, then it's been decaying longer than we think, so the mineral must be older than we think. In other words, a mineral that has lost argon will be older than the result we get says it is. In the other direction, if excess argon has gotten into the mineral, it will be younger than the result we get says it is. An isochron dating method (isochron dating is described in the next section) can also be applied to potassium-argon dating under certain very specific circumstances. When isochron dating can be used, the result is a much more accurate date. Yet a fourth method, rubidium-strontium dating, is even better than potassium-argon dating for old rocks. The isotope rubidium-87 (Rb87) decays to strontium-87 (Sr87) with a half-life of 47 billion years. Strontium occurs naturally as a mixture of several isotopes. If three minerals form at the same time in different regions of a magma chamber, they will have identical ratios of the different strontium isotopes. (Remember, chemical processes can't differentiate between isotopes). The total amount of strontium might be different in the different minerals, but the ratios will be the same. Now, suppose that one mineral has a lot of Rb87, another has very little, and the third has an in-between amount. That means that when the minerals crystallize there is a fixed ratio of Rb87:Sr87. As time goes on, atoms of Rb87 decay to Sr-87, resulting in a change in the Rb87:Sr87 ratio, and also in a change in the ratio of Sr87 to other isotopes of strontium. The decrease in the Rb87:Sr87 ratio is exactly matched by the gain of Sr87 in the strontium-isotope ratio. It has to be -- the two sides of the equation must balance. If we plot the change in the two ratios for these three minerals, the resulting graph comes out as a straight line with an ascending slope. This line is called an isochron. The line's slope then translates directly into a figure for the age of the rock that contains the different minerals. The power of the Rb/Sr dating method is enormous, for it provides multiple independent ways of verifying the accuracy of the isochron. When every one of four or five different minerals from the same igneous formation matches the isochron perfectly, it can safely be said that the isochron is correct beyond a reasonable doubt. Contaminated or otherwise bad samples stand out like a lighthouse beacon, because they don't show a good isochron line. There are numerous other radiometric dating methods: the samarium-neodymium, lutetium-hafnium, rhenium-osmium, and lead isochron methods just to name a few. However, I simply haven't time or room to deal with all of them. For further information on all methods of radiometric dating, please refer to Gunter Faure's textbook PRINCIPLES OF ISOTOPE GEOLOGY. A full cite for this book is given in the bibliography. Now, why is all this relevant to the creation-vs.-evolution debate? Every method of radiometric dating ever used points to an ancient age for the Earth. For creationists to destroy the old-Earth theory, they must destroy the credibility of radiometric dating. They have two ways to do this. They can criticize the science that radiometric dating is based on, or they can claim sloppy technique and experimental error in the laboratory analyses of radioactivity levels and isotope ratios. Is there any way to criticize the theory of radiometric dating? Well, look back at the axioms of radiometric dating methods. Are any of those open to question. Answer: yes, two of them are. Or at least, they seem to be. Do we know, for a fact, that half-lives are constant (axiom 1)? Do we know for a fact that isotope ratios are constant (axiom 2)? Regarding the first question: There are sound theoretical reasons for accept-ing the constancy of isotope half-lives, but the reasons are based in the remote and esoteric reaches of quantum mechanics, and I don't intend to get into that in this article. However, if all we had were theoretical reasons for believing axiom 1, we would be right to be suspicious of it. Do we have observational evidence? The answer is yes. On several occasions, astronomers have been able to analyze the radiation produced by supernovas. In a supernova, the vast amount of energy released creates every known isotope via atomic fusion and fission. Some of these isotopes are radioactive. We can detect the presence of the various isotopes by spectrographic analysis of the supernova's radiation. We can also detect the characteristic radiation signatures of radioactive decay in those isotopes. We can use that information to calculate the half-lives of those isotopes. In every case where this has been done, the measured radiation intensity and the calculated half-life of the isotope from the supernova matches extremely well with measurements of that isotope made here on Earth. Now, because light travels at a fixed rate (a bit under 300,000 kilometers per second), and because stars are so far away, when we look at a distant star we're seeing it as it was when that light left it and headed this way. When we look at a star in the Andromeda Galaxy, 2,700,000 light-years away, we're seeing that star as it was 2,700,000 years ago. And when we look at a supernova in the Andromeda Galaxy, 2,700,000 years old, we see isotopes with the exact same half-lives as we see here on Earth. Not just one or two isotopes, but many. For these measurements to all be consistently wrong in exactly the same way, most scientists feel, is beyond the realm of possibility. What about isotope ratios? Are they indeed constant? Well, let's think about it: Minerals form by recognized chemical processes that depend on the chemical activity of the elements involved. The chemical behavior of an element depends on its size and the number of electrons in its outer shell. This is the foundation of the periodic table of the elements, a basic part of chemistry that has stood without challenge for a hundred and fifty years. So the processes that are involved in mineral formation can't distinguish between isotopes. Sr86 atoms and Sr87 atoms behave identically when they bond with other atoms to form a mineral molecule. If there are ten Sr86 atoms for every Sr87 atom in the original magma melt, there will be ten Sr86 atoms for every Sr87 atom in the minerals that crystallize from that melt. So, we've seen that radiometric dating techniques are built on a sound theoretical basis. The only other possible source of error is in laboratory technique. To translate theory into useful measurements, the lab procedures must be accurate. A contaminated rock sample is useless for dating. A sample that is taken from the surface, where atoms could get in and out easily, is also useless. Samples must be taken by coring, from deep within a rock mass. To date a rock, chemists must break it down into its component elements using any of several methods, then analyze isotope ratios using a mass spectrometer. If the lab technique is sloppy, the date produced isn't reliable. But we can try to minimize error. And when we do, the dates produced can be accepted as accurate. When samples taken from different parts of a given igneous rock formation are dated by different people at different labs over many years, the possibility that all those measurements could be wrong is vanishingly small. Some may well be wrong. If nine analyses agree, and a tenth produces radically different results, the odd-man-out is usually considered a result of some kind of error and discarded. If the researcher doing the work can find and document a specific problem in analysis that could produce precisely that observed wrong result, then it's virtually certain the odd-man-out is an error. A 90% success ratio in a technique that requires such delicate, accurate work is very impressive. And some radiometric techniques have a much better success ratio than that. In any case, while it's true that there are numerous possible sources of error, there is no source of error that could account for the enormous difference between the 6000-year age demanded by young-Earth creationists and the 3.5-billion-year radiometric age for the oldest known rocks on Earth. It's completely illogical to think that these techniques could be wrong by that much. 1) Creationists often claim that radiometric dates are unreliable because the entire theory is based on invalid assumptions. We've already seen that this doesn't hold up under examination. The assumptions that are used in radiometric dating techniques are perfectly justified given current physics. 2) Creationist geologists compile long lists of dates obtained by radiometric techniques that deviate widely from the normally accepted values. Creationist geologist John Woodmorappe is the best known of the creationists who attempt this approach. He's compiled a list of several hundred radiometric dates that are widely divergent from the values accepted by conventional geology. Based on this, he claims that radiometric dating methods don't produce consistent results, that geologists conceal radiometric dates which don't match what's expected, and that therefore the whole methodology of radiometric dating is worthless. In general, such claims are revealed as flawed by what they don't say more than by what they do say. In an article for the creationist journal Creation Science Research Quarterly, Woodmorappe listed 350-odd aberrant dates, and claimed that there are many, many more. What he did not say is that those 350 were winnowed out of tens of thousands of radiometric dates which do give more reasonable results. If we run dating tests on 500 samples and 350 (70% of the total tests) are scattered all over the place, with only a few anywhere near the expected values, then we clearly have a serious problem. But if we run dating tests on 10,000 samples and get 350 aberrant results (3.5% of the total), that could easily be simple experimental error. If we test fifty samples from the same rock formation and we get 2 ages of 1 million years, 2 ages of 500 million years, and 46 ages all clustered around 175 million years, it's not a great leap of logic to conclude that the 4 aberrant results were in error, and the 46 clustered results are probably correct. 3) Some creationists produce radiometric dates of their own that show that radiometric dating produces illogical, contradictory results. A classic example of this tactic is a claim by creationist geologist Steve Austin that rocks taken from Recent lava flows on the Uinkaret Plateau at the top of the Grand Canyon produce older dates than rocks taken from the bottom of the canyon, when both samples are dated using the Rb87/Sr87 isochron method. This appears to be a serious blow against the Rb/Sr isochron technique, but in his article "A Criticism of ICR's Grand Canyon Dating Project," Chris Stassen points out that Austin made a critical error in his work. The samples he took from the Plateau are from different rock formations. For any type of radiometric dating to work properly, all samples must come from the same formation. So it's not surprising that Austin's results make no sense. We're still not done, though. If all we had was the radiometric techniques that I've described, there would remain a possibility (a miniscule one, but a real possibility nonetheless) that the entire idea is grievously wrong, that some as-yet-undetected factor is throwing off all the hundreds and thousands of radiometric dates that have been produced based on rock samples from all around Earth and even beyond it. But we have more than that. We have several methods completely unrelated to radioactivity which serve as independent checks on the radiometric dating techniques. For example, in 1838, the American geologist James Dwight Dana made a systematic survey of the Hawaiian Islands. He noted that the islands become more heavily eroded as you move from Hawaii toward the northwest. He interpreted this to mean that the islands become older as you move northwest along the chain. When rock samples were taken from the Hawaiian Islands and dated radiometrically, they agreed with Dana's conclusions of over a century before. The islands do indeed become older as you move northwest. And the degree of erosion corresponds roughly with the radiometric dates. No island in the chain is dated as being significantly older than the erosion rate implies, nor is any island in the chain dated as being significantly younger than the erosion rate indicates. Both modern corals and fossil corals deposit daily and annual growth bands. By careful analysis of these bands, we can tell how many days there were in a year when the coral was growing. For modern corals, this technique yields 365 day-bands per year, more or less, just as it should. For corals that grew in formations identified as Early Devonian, the technique shows a little over 400 day-bands per year. Astronomers can measure the rate at which Earth's rotation is slowing. Assuming the rate of slowing has remained constant, a day-count of 400 days per year indicates an age of roughly 400 million years. And when Early Devonian rocks are dated radiometrically, we get dates of roughly 400 million years. Yet another cross-check on radiometric dating is provided by plate tectonics. The plates that form the Earth's surface are moving at a measurable rate. There are several ways of measuring this movement that themselves have nothing to do with radiometric dating. The plate that forms the Pacific Ocean basin is moving northwest at at a known rate. Geologists generally accept that the Hawaiian Islands have been formed by upwelling of magma from a 'hot spot' in the Earth's mantle, below the seafloor. The Pacific Plate is moving; the hot spot remains fixed; and the result is a series of volcanic islands growing upward over the hot spot. Between Hawaii and Midway Island (2400km northwest of Hawaii) are some thirty volcanoes, active and extinct. Many of these volcanoes have had lava flows dated by the potassium-argon method. In all these cases, the radiometric date agrees substantially with the date derived from extrapolation of plate motion. Particularly striking is the correlation for Midway Island itself. By drift rate it should be about 27 million years old. By K-Ar dating, the volcanic rock that forms Midway's core is 27.7 million years old. Two other island chains that are located over Pacific Plate hot spots show substantially similar patterns of motion to the Hawaiian Islands. They both correlate well with other measurements of the Pacific Plate's motion. And their radiometric dates match as well. Three independent methods of dating these islands, and they all agree within acceptable ranges of error. What are the chances of all three being wrong in such ways as to produce the same wrong answer? There's no way to calculate them, but I'd say they're so miniscule that you'd have better odds of hitting the state lottery five times in a row. One more example, just to wrap things up. In the late sixties, two geologists identified a specific reversal of the Earth's magnetic field using the rocks in Olduvai Gorge in Africa. (Olduvai Gorge is famous as one of the best sites in the world for early hominid fossils.) They called this reversal the Olduvai Event. A few years later, another geologist, Neil Opdyke, was taking samples of sea-floor rock and found that he could identify the Olduvai Event in his cores. Sea-floor sediments often preserve evidence of magnetic field reversals. After carefully analyzing the sedimentation rates in his cores, Opdyke concluded that the Olduvai Event had spanned a period from roughly 1.85 million to about 1.5 million years ago. Obtaining radiometric dates from Olduvai Gorge is difficult for several reasons, but one of the few dates that's considered solid comes from a specific layer of volcanic tuff called 'Tuff 1B'. This tuff occurs near the bottom of the Olduvai Event. It was dated in 1959 using the potassium-argon method. The date produced was approximately 1.8 million years ago. Far from being rickety constructs full of sources of error and unproven assumptions, radiometric dating techniques are actually on a very sound theoretical and procedural basis. To destroy that basis, creationists would have to destroy much of chemistry and a lot of atomic physics too. The periodic table is the bedrock on which modern chemistry is built. The constancy of the velocity of light is a basic axiom of Einstein's theories of relativity, theories which have passed every test physicists could devise. The constancy of radioactive decay rates follows from quantum mechanics, which has also passed every test physicists can create. In short, everything we know in chemistry and in physics points to radiometric dating as being a viable and valuable method of calculating the ages of igneous and metamorphosed igneous rocks. To question it seems to be beyond the bounds of reason. To charge thousands of chemists all over the world with mass incompetence also seems to be beyond the bounds of reason. Radiometric dating has been used ever more widely for the past forty years. The dates produced have gotten steadily more precise as lab techniques and instrumentation has been improved. There is simply no logical reason to throw this entire field of science out the window. There is no reason to believe the theory is faulty, or to believe that thousands of different chemists could be so consistently wrong in the face of every conceivable test. Further, radiometric dates can be checked by other dating techniques. When they are, the dates almost always agree within the range of expected error. In cases where the dates don't agree, it's always been found that some natural factor was present which selectively affected one or the other dating method being used. Creationists are forced to challenge radiometric dating because it stands as the most powerful and most damning evidence against their idea of a young Earth. But in the end, they are reduced to saying that "radiometric dating must be wrong, because we know it happened this way." And that is not a scientific position. If theory says it happened this way and evidence says it happened that way, theory must be revised to fit the evidence. Creationists won't do that. That reveals creation 'science' to be a sham, and not any kind of science at all. Information on the nature of atoms, half-lives, and types of radioactive decay was taken from ATOM: Journey Across the Subatomic Cosmos, by Isaac Asimov (c. Nightfall, Inc., 1991). PRINCIPLES OF ISOTOPE GEOLOGY, 2nd Ed. EARTH THEN AND NOW, 2nd Ed. "Scientific Creationism vs. Evolution: The Mislabeled Debate"
GROLIER'S ACADEMIC AMERICAN ENCYCLOPEDIA, 1994 ed. "The Unreliability of Radiometric Dating"
c. SCIENTIFIC AMERICAN, Nov. 1973. Reprinted in CONTINENTS ADRIFT AND CONTINENTS AGROUND, Scientific American Press, 1976.
c. 1989, Wm Morrow and Company, Inc.
A TRIP THROUGH TIME: Principles of Historical Geology, 2nd Ed. These sources are supplemented by references in other books, numerous threads on several CompuServe forums, and other papers and articles downloaded from CompuServe and the World Wide Web. NOTICE: This essay is copyright 1996 by Jonathon Woolf. It may not be reproduced in whole or in part, by any means whatever, without the express written consent of the author. Wolf photo in header from a public-domain US Park Service photo. Atom graphic is from "Holy Cow! 250,000 Graphics" collection. All corporate logos and symbols are property of their respective owners, used under terms specified by their owners. All other content on this site is copyright Jonathon Woolf, unless otherwise noted. Please see my Site Policies page for more information on copyright and other site details.